While it would be nice to leave the house with the smallest of Mulberry clutch bags, the reality of having a baby in tow means that with every outing a whole heap of ‘stuff’ is needed. Be it nappies, bottles, snack bribes, your own sanity - fitting these necessities as compactly as possible can be a challenge. 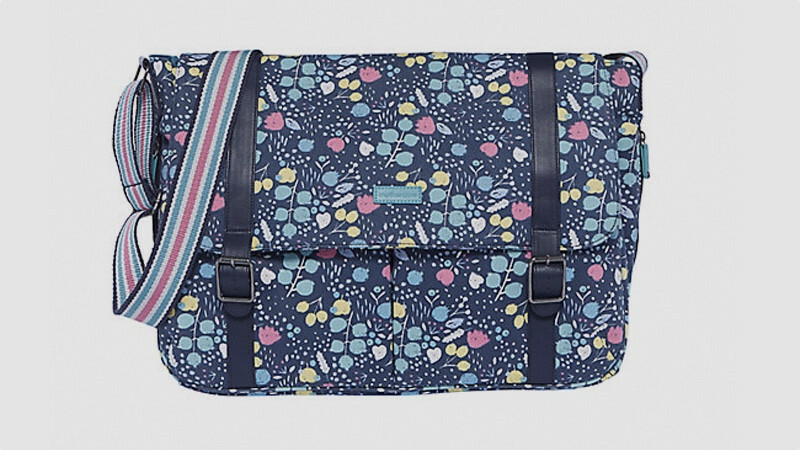 You can convert your existing handbag into a baby-friendly version by adding an insert such as Shnuggle BumGo. This is a wonderfully compact ‘changing wrap’, which features a wipes dispenser and padded changing mat all in one. The good news however is that the latest breed of bags dedicated to parenting do not compromise on style. You’ll find a host of designs online with hidden pockets for nappy sacks and mobile phones alike, as well as insulated bottle pouches for keeping drinks cool or warm, and light-coloured linings to make your things easy to find at a glance. Here are a few of our favourites that are practical enough to give Mary Poppins’ carpet bag a run for her money. 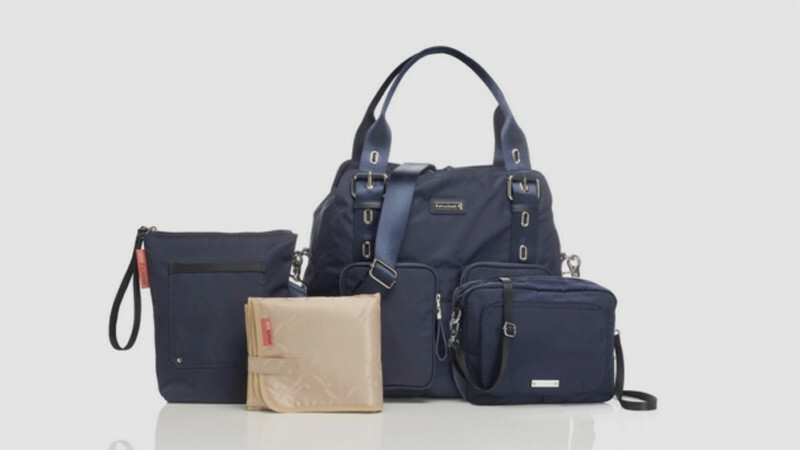 A leading baby changing bag brand in the US with a celebrity following that includes Sarah Jessica Parker and Justin Timberlake, Ju Ju Be sells a popular hero product called the B.F.F. This is a 3-in-1 handbag, crossbody bag and backpack. It comes in a range of colourful patterns including a wacky Hello Kitty design and a more sober Rose Sakura Swirl design, pictured here. The bag includes practical features for adults and children alike and has pale-coloured linings to makes things easy to find, a sunglasses and mobile phone pouch and insulated bottle pockets. 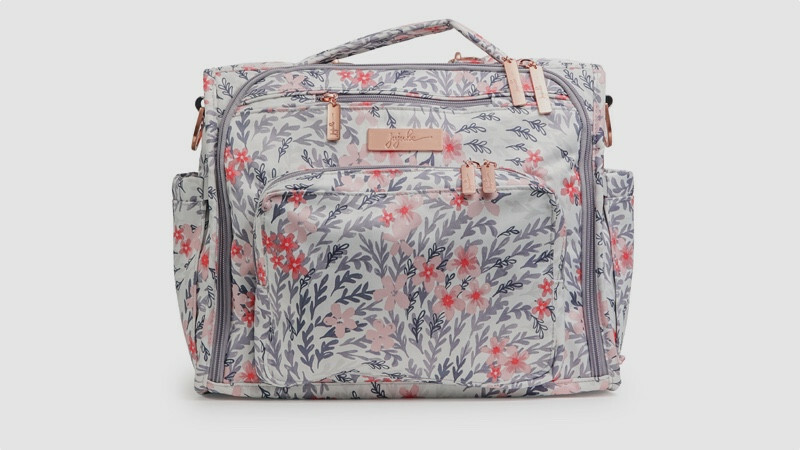 As well as being able to carry it in a variety of ways, what makes this bag so unique is the fact that it can be machine washed – a feature that’s very handy after a few outings with your newborn. While you’re online, don’t miss Ju Ju Be’s eye-catching Hatch Gene, specifically aimed at men and the company’s latest collection of vegan-leather designs just launched. There’s something beautifully satisfying about the clean and classic good looks of the Pacapod Saunton changing bag, which comes in a sleek faux-leather tan colourway. What we love most about the Pacapod is the ability to adjust the straps to suit your mode. Wearing your baby in a sling? Then use it as a backpack and go hands-free. Got the baby in the buggy? Switch to messenger style. There’s a padded changing mat and pram clips included in this design, as well as map-print feeding, changer and pacifier pods. These can be removed when required to make room for bulkier items such as a tablet or laptop. For a less expensive tan-finish option, check out its similarly styled rival the Babymel Grace, which costs £60. Tiba + Marl is a contemporary parent changing bag company that prides itself in creating practical backpacks, clutches and holdalls in stylish high-tech materials. Working neatly as both a hand-held tote and a hands-free backpack, the Tiba + Marl Franklyn tote is satisfyingly unisex in style. Made from a nylon fabrication, you’ll find discreet side slip pockets, a waterproof rear zip pocket and a front zip pocket on its luxurious exterior. Its interior is equally handy. There’s an insulated bottle holder and two large internal elasticated pockets for housing nappies and wipes, and also two extra internal slip pockets, and a padded changing mat. 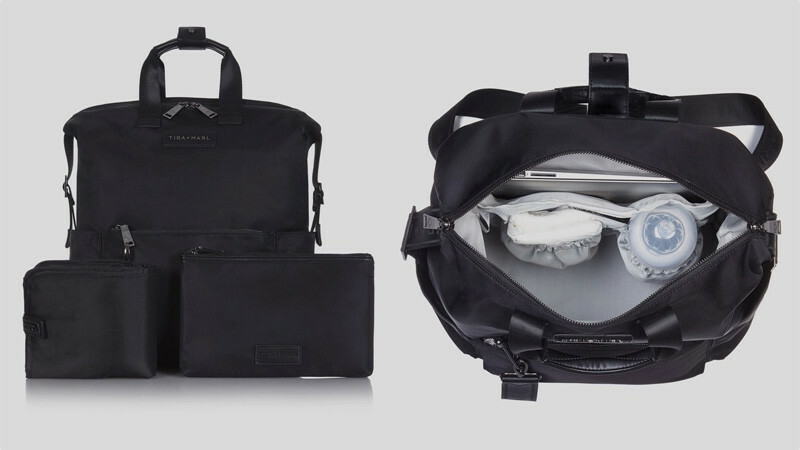 Should you need to mix work and play, there’s also a smart phone pocket and internal padded laptop sleeve. Although it’s not machine washable like Ju Ju Be’s design, it does have a wipe-clean nylon lining. Planning a weekend away? Then the Alexa Navy and Mini-Fix is, quite literally, your bag. This set is great value as it features the Alexa, which is a main bag and comes with a shoulder strap and stroller strap, and a matching Mini Fix, which can be used like a clutch or messenger bag for quick trips. What’s great about the Alexa is its super wide opening, which means you can easily take your things in and out. It’s made from water resistant nylon and inside there are three compartments, five internal pockets and two outer zipped front pockets. And, as well as a machine washable changing mat, it has a separate insulated ‘Snacky Sak’ to keep drinks and snacks fresh. The Mini Fix has room for a pack of wipes in the front section and space to house baby bits such as creams and nappies in its second compartment.Once you’ve bought into this set, you won’t need more. This sub-£20 design is great value for money and ticks all the boxes in terms of practicality and style. It comes in a head-turning Woodland Berries design and at 0.95 kg is a lightweight option. It can be carried across your chest or attached to your buggy using the adjustable stroller straps. At 5.5cm high, 33cm wide and 51cm deep, it may not be the roomiest design in our round up, but its compact accessories help to keep its interior neat. It comes with a removable padded changing mat and inside you’ve got enough space for all the essentials such as a set of clothes, nappies, wipes and muslins. It has two insulated bottle chambers inside for keeping bottles warm or drinks cold and two removable bags for clean and dirty clothes. Job done.